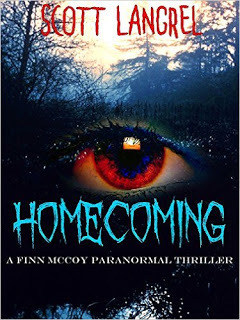 Finn McCoy is a paranormal handler. He handles things that ordinary paranormal investigators can't or won't, and he often ends up cleaning up behind them. Homecoming, is a well-paced, well-written suspense horror. The main character Finn McCoy is down to earth and home-grown which makes him likable. He and his beat-up pick-up truck named Boo make a perfect pair. Mr. McCoy even has a girlfriend he apparently picked up on a previous case. Her name is Amanda and she seems to be the right temperament for a paranormal handler: smart and stubborn. I enjoyed the way Langrel created and described McCoy's world. Much like our own, but the a few more shadows and a little less light. The story was uniquely presented, has a few twists and an overall happy ending for almost all (well someone has to die, it is after all a horror!). I didn't find the book scary at all but then again it takes a lot to give me goosebumps. Looking forward to reading the rest of the series.